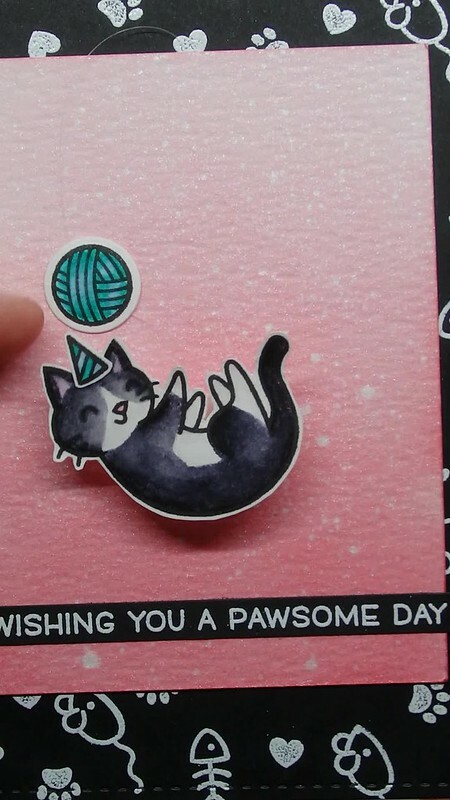 For this card I used Lawn Fawn “Meow you doin'” stamp set, that I think is fabulous! I stamped the images on Bristol papel using Versafine Onyx black ink, colored them with Zig Clean Color Real Brush markers and fussy cut everything. The cat is colored like Sakura 🙂 Next, I trimmed a piece of watercolor paper and blended Worn Lipstick Distress Ink, trying to achieve an ombre effect. I spritzed the watercolor panel with a mixture of water and Perfect Pearls, and I dried it with a paper towel after few seconds. Then, I used the big die from Mama Elephant “Peek a frame” dies on black cardstock for my background panel. I randomly stamped the fishbone, the mouse, the paw print and the heart with Versamark ink and heat embossed everything using white embossing powder. I also white heat embossed the sentiment on a thin stripe of black cardstock. Sakura with her birthday card. I hope you like this card!! Thanks for stopping by! your card is just so sweet. Best of luck for challenge. Oh my goodness, this card is absolutely adorable! I love the interactive element! Love how you colored the cat to look just like your cutie! So happy you shared with us at Lawn Fawnatics!